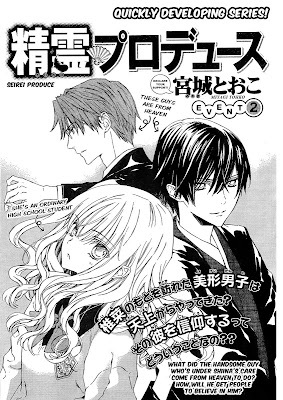 Next up is "Seirei Produce" chapter 3. Shiina, Amane, and the Kitsune engage in a game of strip Rock-Paper-Scissors (Jan-Kan-Po). Heheheh...Look forward to it ;p.
Recruitment was a huge success! It looks like we got all the help we need including someone to help out a little with the Japanese. Thanks to everyone who responded. I hope to announce the new members of the team in the upcoming weeks :). Omari's Sister is recruiting! 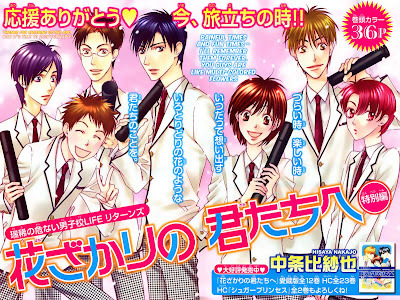 We need one or two cleaners to help on "Kimi ni XOXO," "Zettai Heiwa Daisakusen," and the one-shots. Experience as a cleaner is desired, but not needed. 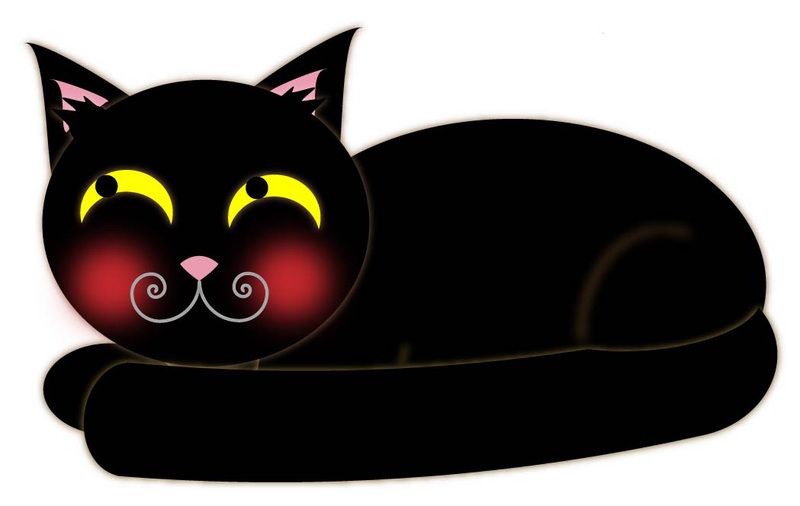 If you have Photoshop software, but no or little experience cleaning, I (Kuroneko003) will train you. If you are interested, please use the "Contact" link in the main menu to send me (Kuroneko003) an e-mail (or just link the word in this sentence). Also, as always, I'm looking for a second translator :). 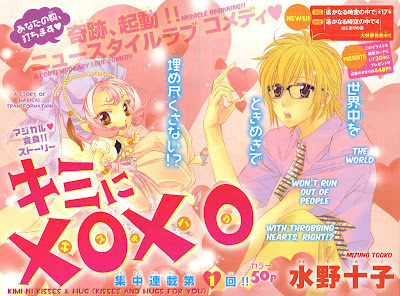 I'm Going to Finish "Kimi ni XOXO"
I've decided to finish "Kimi ni XOXO." 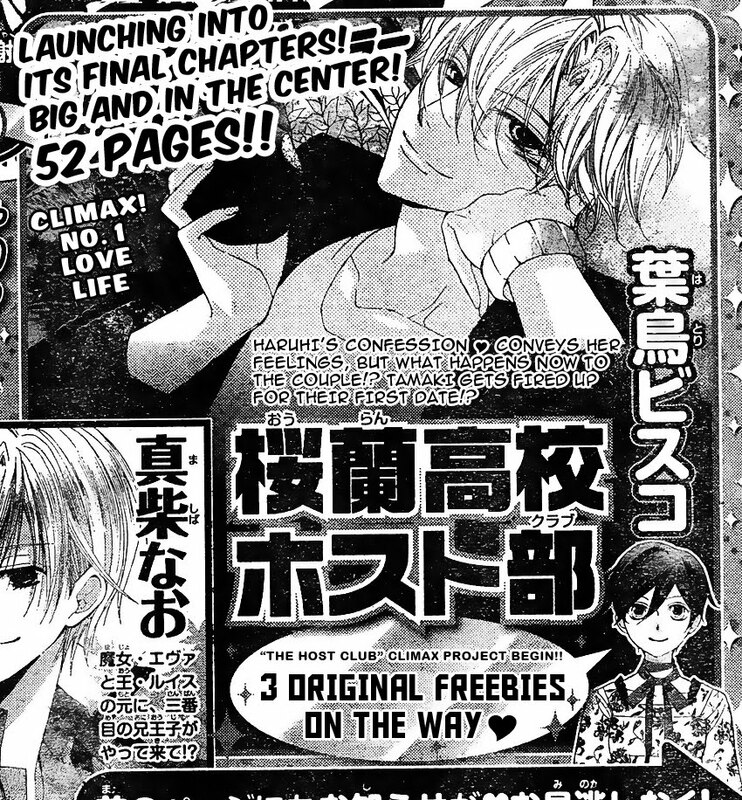 The second chapter is pretty good and according to the preview, chapter 3 is the climax of the story meaning that this series will end very soon. 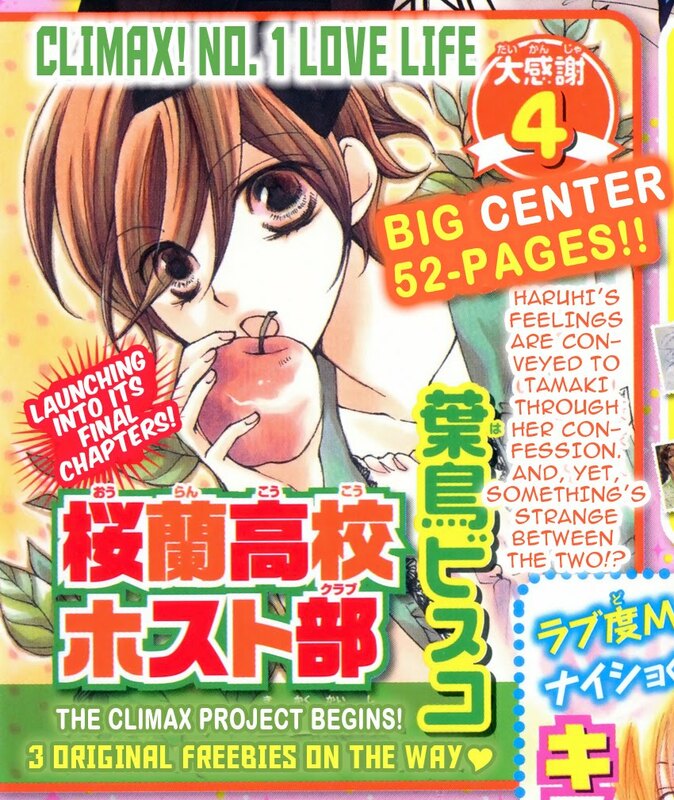 My guess is that there will be 4 chapters and a forthcoming one-shot about something else. We'll have to wait and see. Given that the story is cute and the commitment is light, I'll go ahead and finish this series. Here's a link to Ogura Akane's (ZHD) website. Orange Chocolate Chp 14 + Wallpaper! Rejoice! 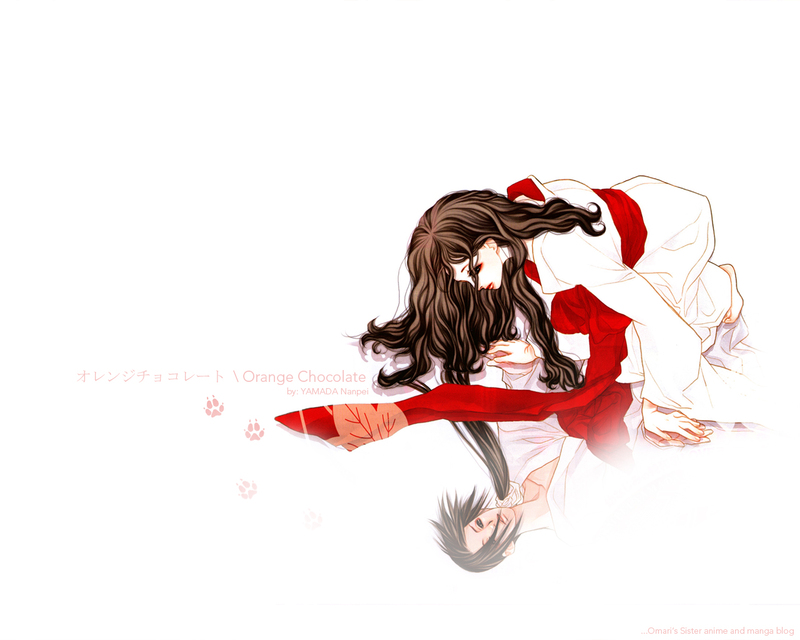 Sephyna has made "Orange Chocolate" fans a lovely wallpaper for this release! Here's "Orange Chocolate" chapter 14. This is the lead-in to a new story arc and the introduction of some new characters. Chapter 15 and 16 are really fun and have some wonderful illustrations. I can't wait to bring those chapters to you. 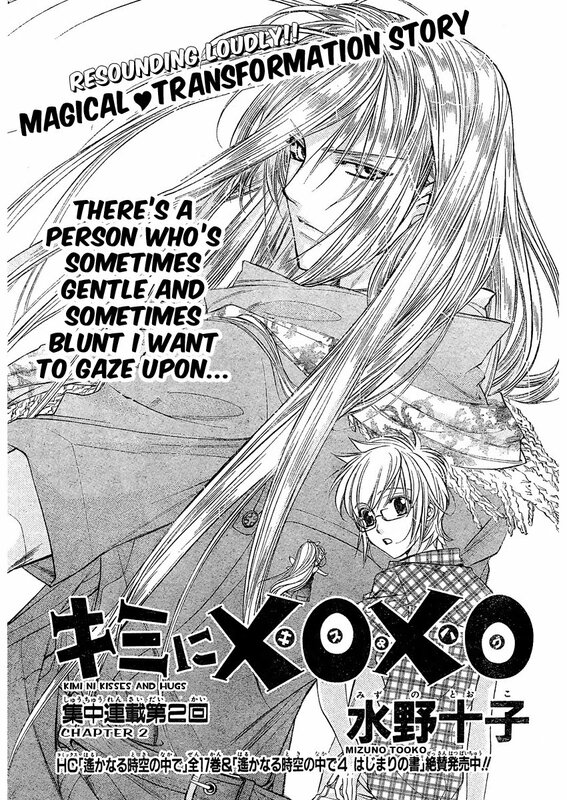 Next up is "Kimi ni XOXO" chapter 2. So far the chapter is good and I think I will be sticking with this series. He's definitely earned the "boo-boo" face from me ;p.
I honestly never though Joshua could be so despicable. Yet, he's so pathetic that I can't completely hate him. It's like, "There, there little monkey. What happened? Not enough hugs?" And, yet, I want to leap into the pages and beat Joshua senseless when I think about poor Johanne who is now imprisoned in a comfy jail awaiting execution or rescue or the perfect time to escape in order to, perhaps, finish what he started at the end of chapter 14. (I'm having popcorn while translating if Johanne flies the coop. Personally, I was looking forward to commando-style Yuda -- eep! That came out wrong...) Anyhow...I'm a nice person who doesn't condone fictional murder, but believes in a good fictional sack beating for those characters who deserve it. However, I want to know how you all feel. Does Joshua need a sack beating (2 varieties to choose from), a hug, or to die a convenient "Disney Death?" Take the poll! Leave comments if you want to talk about Joshua or anything ZHD chp 17. 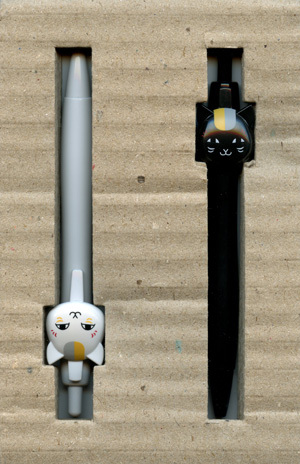 These pens are super cute, but in reality they are only 4-inch long. Check the Magazine Freebie List page on this blog for a listing of past items from Lala magazine and the other magazines I purchase. The link is located at the upper right corner of this blog (or click the link in the previous sentence). 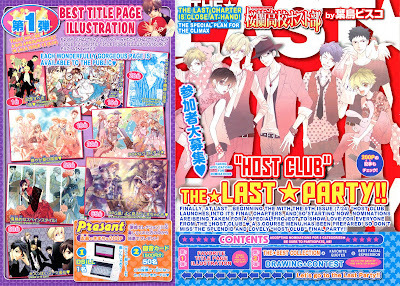 Here are the reference pages explaining the "Host Club" final party project. The section that reads "Present" are just descriptions of the prizes available from the raffle associated with each part of the project. I don't expect anyone who reads this blog entry to try to enter the contests, but I went ahead and translated most of it because I felt it was a nice retrospective on the series. Also, some of you may want to go through the motions of the contest activities, but not actually enter. 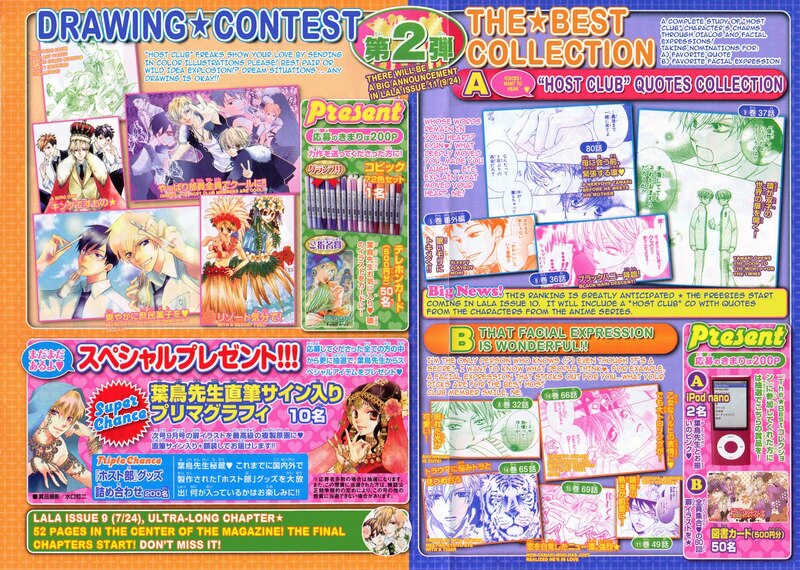 Note: It looks like the big prize ("Super Chance") is a signed graphic from Hatori-sensei. 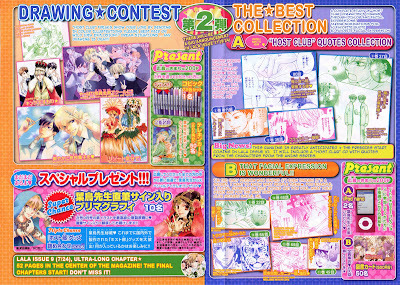 Here's the last page (very poor quality from the magazine) that covers choosing the best cosplay scenario and summarizes the stuff from the color pages. I decided to break up the previews and the project announcement into two separate postings. The project posting won't be finished until tomorrow because it requires a lot of detailed work. 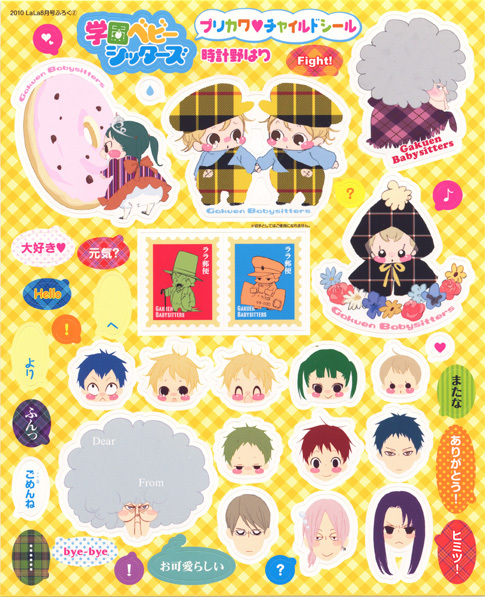 Anyhow, here are the previews from Lala magazine. 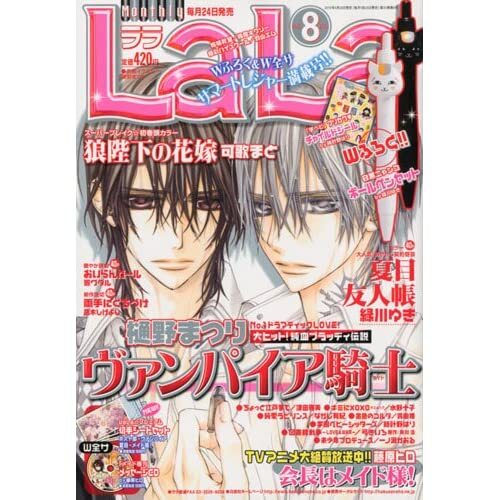 Update 7/28/2010 -- the only Ouran freebie I can confirm is the drama CD that is coming with Lala 10. 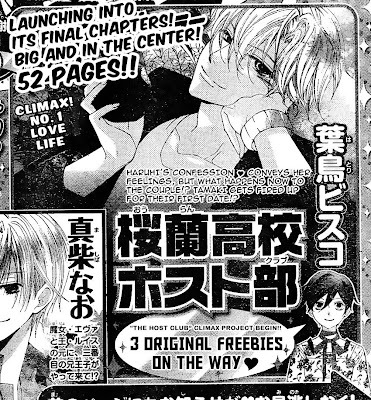 It looks like there will be at least 3 (including chapter 81) more chapters and with each chapter starting at issue 10 there will be a special Ouran freebie included inside Lala magazine. The first freebie will be a CD with favorite quotes from the Ouran anime series. The project is a 3 part fan project with prizes that will be raffled off. 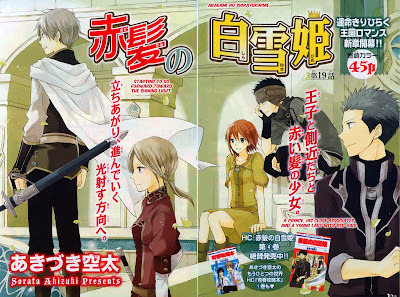 I will translate most of the project announcement because it is a very nice retrospective on the series. I will put that out tomorrow. 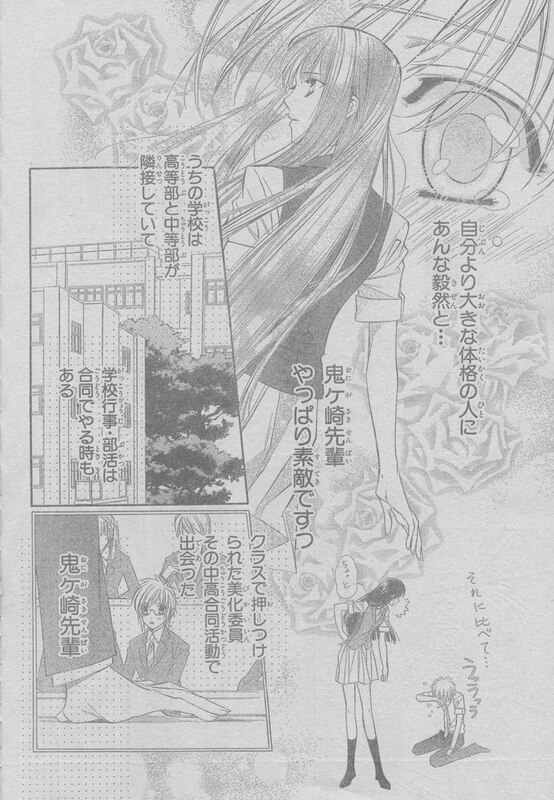 From the preview, it looks like Hatori is done with the Suoh family drama and is now moving on to resolve Tama x Haru. Here's the latest Hana-Kimi Extra story from one of the May 2010 issues of Hana to Yume. 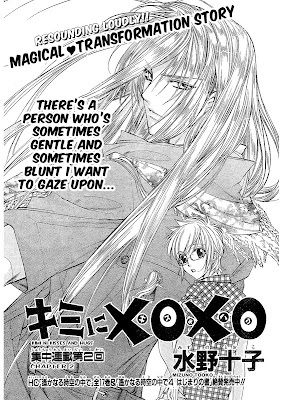 Well, it's begun...So far I've noticed that series licensed by Viz have been removed from MangaFox. Good for Viz! I know some of you who read scanlations are quite upset and I feel bad for those of you who cannot access these series without scanlation. Viz, though, has to protect its market in the US. Hopefully, once the manga aggregators purge their sites of licensed series, the pressure will be relieved and we can continue to enjoy series that are new outside-of-Japan or too niche-y to license outside of Japan. Update: It's interesting to see what manga/manhwa rose to the top after of the popularity stack after MangaFox removed the Viz licensed titles. Most of the top series are Shoujo. Honestly, this seems quite healthy to me because many of these titles I've never explored and now that they are exposed, maybe I'll give them a read. Here is "Zettai Heiwa Daisakusen" chapter 17. Hopefully, this is the lowest emotional point in the story. If it isn't, I don't know if I could handle any more bad befalling these characters I like so much. 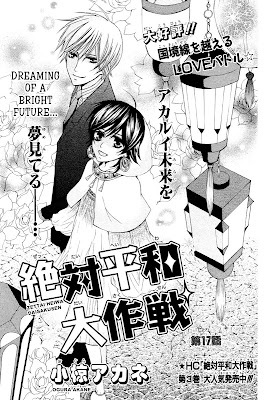 From the way the chapter ends, it looks like the next chapter will be a flashback chapter -- or so I hope, because I would really like to see how Yuda and Johanne met during the war. Read beyond here after you've read the chapter because what I ramble, may contain spoilers. Here's a nice blog posting about the current scanlation issue. Wow! 3-Years of Omari's Sister! Woo-Hoo!!! Check out our special alt banner! It a "collaboration" between Silver Lunar and myself :). I can't believe I've been blogging on this blog for 3-years. Apparently my first post was on May 25, 2007. I'm coming up on my first anniversary as a scanlator on June 26th. Wow! I can't believe how far I've come since that first awful Ouran effort :). Thanks to the folks who have joined to make Omari's Sister a team and thanks to all the readers for your support! In this chapter we get more of a feel for Shiina and her family situation. I really like Shiina! Her mother is pretty funny too. Amane's, though, is a brat and is treated a little too much like eye candy (he kinda reminds me of "Aram" from "Meru Puri". But turn about is fair play I like this series, so we will take it on as a project! Lala DX 7/2010 should be ready for me to pick up tomorrow. According to the cover displayed on Amazon Japan, "Akagami no Shirayukihime" will be 45-pages! I don't see anything on the cover about ZHD, but I do see the mangaka's name on the cover with a list of others names...hmm...I guess we'll find out what that's about tomorrow. 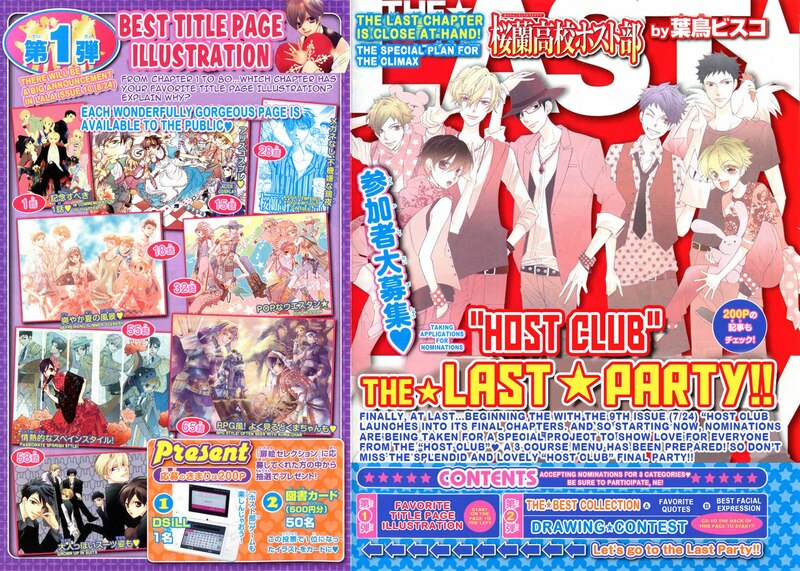 Retiring Most Chapters of "Ouran High School Host Club"
Update: Retired all chapters of Ouran except for chapter 80. Chp 80 will be retired shortly after the release of chapter 81. 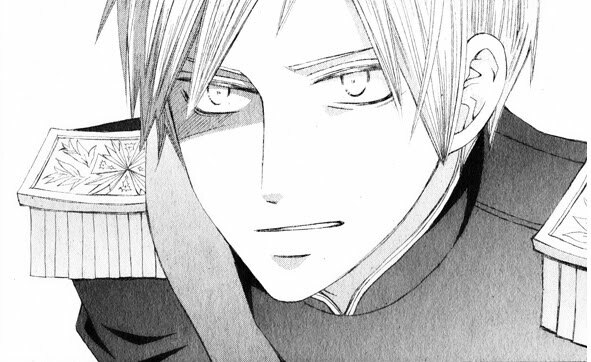 I am retiring up through chapter 78 of "Ouran High School Host Club." After the "Ouran" series ends, We will no longer scanlate series that are already licensed in the US. Here's an article about it from Publisher's Weekly. Yikes, everybody...so you haven't been buying the books...hmmm...Actually, I know this very well, since NONE of you have bought a book from Amazon through the links I provide and less than .1% of you even click on the links. All of you understand that "free" is not a business model. Well, I certainly don't do scanlation to hurt the publishers or the artists and I'm sad to see that consumers will not pay for their favorite manga titles when they do become available for purchase. At the same time, manga at ~$10/volume, in the US, costs way too much for the target audience. Also, there's the problems of most US publishers being several years behind the Japanese release for manga series and don't let me get started about the space and tree destroying issues associated with multiple volumes of a series. Sigh...it's all messed up and it will get even more messed up as lawyers are brought on board. I really wish there way for us to all get along. Anyhow...so the important thing to come up with is what to do about what's going on. I want to continue to introduce manga series that are not available in the US in hopes that they do become licensed so the artists can make some money for their labor. I, too, would like to make money for my labor translating it. On the licensed manga front, I have removed Arakure ("Wild Ones") from my blog, however, I cannot control distribution on the manga aggregation sites. I will, though, take the step to no longer upload any of my translations of US licensed manga to any manga agreggation sites. I also will start removing my translations of "Ouran High School Host" from my blog. 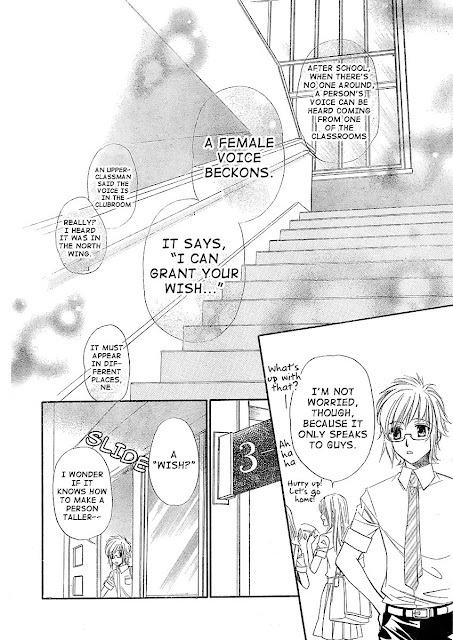 To the extent that I feel comfortable, I will continue to translate "Ouran," until the series ends. But I may consider a time limit for the postings. What can you all do? You can buy at least one volume of your favorite manga series, also, on the publisher's website, make your desire for electronic manga known. Let the publishers know how much you are willing to pay for it. Set their marketing experts' and business people's expectations correctly. I will say, sooner or later, we all will have to pay. And if we don't pay with money, then we will pay with personal information or we will pay by having to waste our time looking at advertisements. "The WallFlower" Vol 1 - 16 -- Volume 6 sold! As always, if you purchase, multiple items, I'll refund some of your shipping! Just mention you saw this blog entry! Here it is! "Kimi ni XOXO" or "Kisses and Hugs for You" chapter 1. After I finished and read the chapter in English in its entirety, I decided that I like the first chapter and I want to know what happens next (yeah, that sounds weird considering that I translated it). Please give me some feedback on whether you like this first chapter or not. And now, here's the link. Next up, I will try to sneak in chapter 2 of "Seirei Produce" before Lala DX 7/2010 releases. "Professor Busujima's Egg" is a joint project with Hyper Parfait! It's a pleasant light read :). Please go to Hyper Parfait to download this delightful one-shot! Here's a short preview of "Kimi ni XOXO!" The section I am previewing is at the transition from the lackluster sweetness of the middle-beginning (the very beginning is very funny) to the funny and spunky goodness of the second half. I hope you enjoy it and I hope it gets you to anticipate the chapter in its entirety. Please excuse any typos or errors you see. This has yet to go under any quality check and is subject to be a little different in the final version.